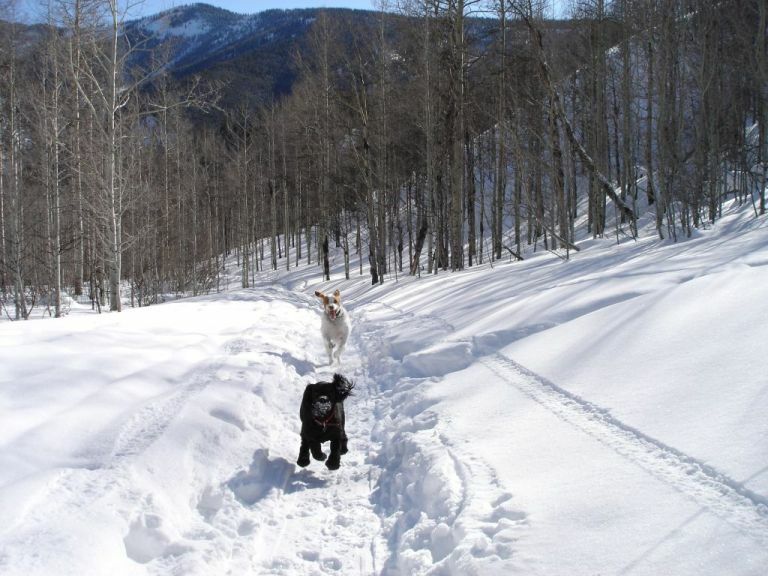 flyingcracker.com - weather, cocktail and food recipes, stories, driving conditions and maps, and news for Crested Butte Colorado - Dogs Gone Wild! OK, maybe our dogs haven't exactly gone wild. Although sometimes you would be hard pressed to be sure. They roughhouse with each other all the time. The main challenge around flyingcracker headquarters is giving them enough exercise. We usually take them up Cement Creek Road to the Cave Trail or Walrod Gulch. Lately we found that Duke pulls quite strongly on the leash while I nordic ski behind him. Soon we'll have to try the ski-joring setup you can rent at the CB Nordic Center and see if he is a potential "jorer". Hey, we are more than happy to have Duke pull one of us around the poop loop. Ceilidh is growing by leaps and bounds. If you saw her at eight weeks you'd hardly recognize her now. 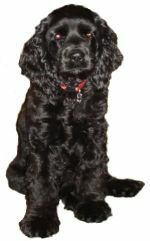 So perhaps you deserve a quick recap... We got Ceilidh in September from a local breeder. She (Ceilidh) was eight weeks old, weighed eight pounds, and was cute as a button. Then in October we got Duke from the Brittany Rescue organization out of Houston, Texas. His age is unknown but several veterinarians think he was probably around two years old. Brittanys never really outgrow their puppy-like tendencies so their age is hard to tell. Now Ceilidh is twenty pounds of solid muscle and Duke, well, Duke is still a pudgy forty or so. He has maintained a very nice "winter layer" of insulation. The two dogs bonded the instant they met. Seriously. They played and played when they first time met and haven't stopped yet. As it turns out, Ceilidh is the dominant dog... Like a lot of women, she gets what she wants, when she wants it. Duke seems confident in his masculinity and happy to let her have her way. A few weeks ago Ceilidh spent a night with a friend and Duke fretted about the house all night wondering where his pal had gone. Their reunion was a joy to watch. We are not sure all of Duke's intentions are honorable though, so Ceilidh is getting spayed the day after Valentines Day. How about that for irony. They will surely remain friends afterwards but perhaps with a little less, ahem, tension in the air. As we mentioned earlier, both dogs come with us on local hikes. Here is Ceilidh leading Duke back to the photographer in Walrod Gulch. You can see she spends quite a bit of time in mid-air. Here they are waiting to go inside after a frigid -10 degree F walk outside in January. You remember those cold nights, right? 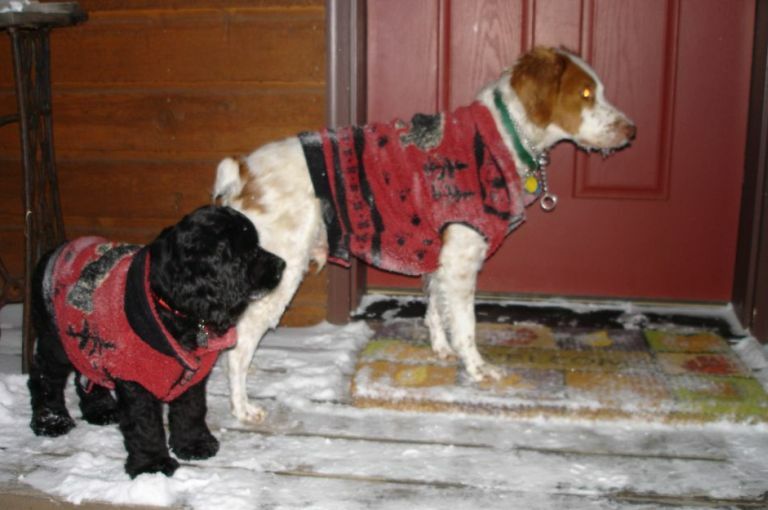 Well even with their fur we think Duke and Ceilidh were happy to have warm sweaters. Note the frozen drool on Duke's muzzle. Brrrr! 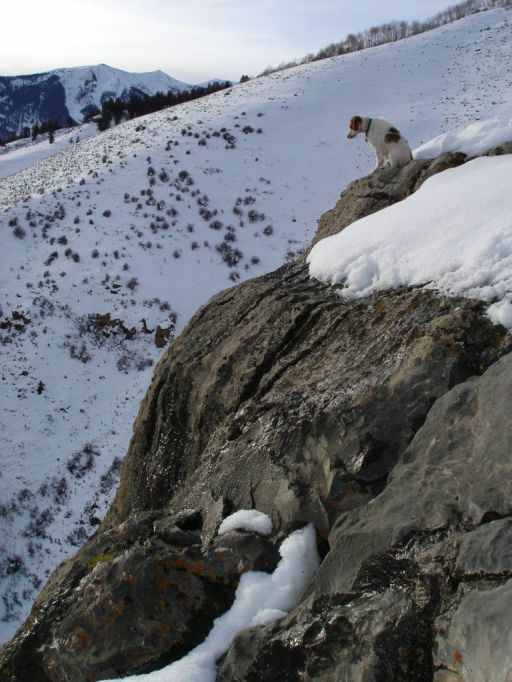 And finally here is Duke on top of the caves trying to give the flyingcracker staff a heart attack. His perch is at least fifty feet above the nearest solid ground. He just sat there watching cars drive by way way down on the road below. We're not quite sure what, if anything, he was thinking. So that's the latest animal update. We'll post more photos as the adventures pile up. Cheers!